Mat is a founding partner of Grell & Watson and brings a unique background and 18 years of IP experience to the firm. Mat currently concentrates his practice in patent drafting and prosecution and business contract drafting and negotiation. 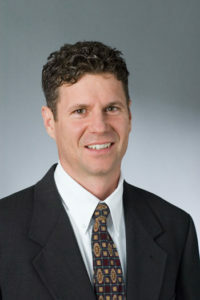 Prior to founding the firm, Mat was a patent attorney at Myers & Kaplan, an IP boutique in Atlanta, GA. From 2000-2004, Mat was VP & General Counsel for Movaz Networks, Inc. His primary responsibilities included duties as a member of the executive team, including detailed experience with formation, raising $150M in capital, business contracts, intellectual property rights, HR/employment, corporate policy, M&A due diligence, dispute resolution, sales and business development, engineering & product management legal support, supply management and export compliance. From 1993 to 2000, Mat was a Patent Lawyer and Senior Licensing Officer with the University of California Office of Technology Transfer & earlier at Michigan State University Office of Intellectual Property preparing provisional patents, marketing and licensing university technology. IP Experience – Mat’s patent prosecution experiences (Patent, Provisional, Trademark, Copyright, applications and searches) and more specifically telecommunication systems, optical switching, micro-electro mechanical systems (MEMS), optics and optical electronics, analog/digital circuits, power electronics, check processing, financial systems, insurance & plant inspection systems, desalination systems, waste water treatment apparatus, door and cabinet hinges, door closure and latch mechanisms, mechanical devices and systems, software, and business methods, among others. General Counsel – Movaz Networks $150M VC funded telecom hardware/software company providing next generation all-optical network solutions based on University patent pending portfolio. Member of the executive team, including detailed experience with formation, raising capital, business contracts, intellectual property rights, HR/employment, corporate policy, M&A due diligence, dispute resolution, sales and business development support, engineering & product management support, supply management and export compliance. Chaired & managed an IP disclosure & review committee. Mat prepared US patent and trademark applications and managed outside counsel, including patent and litigation counsel. Entrepreneur – Founded start-ups such as www.InventorStartKit.com The kit includes a digital download with inventor information & instructions, actual samples, and your own ready to use forms for recording your invention, evaluating the protectability and marketability of your invention. In addition, the website offers helpful educational information about inventions; Inventor NDA; and Inventor Business Plan Kit. www.BeanPool.com is a on-line and print publishing company in the local search arena. BeanPool provides a trusted resource for on-line users to share their opinions on local businesses and to connect with each other and with the best businesses in their community. IP Licensing Experience – Senior Licensing Officer with the University of California Office of Technology Transfer & Michigan State University Office of Intellectual Property Manager of Engineering & Physical Sciences, Office of Technology Transfer System wide office. Managed technical writers, technology marketers and an intellectual property portfolio of 300+ inventions yearly, negotiated and drafted terms and conditions of research, material transfer and license agreements (software, electronics, medical devices, physics& plant varieties), managed patent interference actions, mediation, arbitration, litigation and outside counsel. Corporate Contract Experience – NDA, development, prototyping, contract manufacturing, trials, quality assurance/testing, interoperability, purchase & license, support, maintenance & EFI services, patent & software licensing, reseller/distributor, services, teaming, OEM, software escrow agreements, IT, web development, joint development, supply, promotion, and other business contracts. Engineering Experience – Worked as a controls Engineer, Department of Power Operations, Hydroelectric Power Plants Union Electric. I managed 15 electricians & mechanics as the senior project engineer for the automation and remote control of hydroelectric generators using PLCs, rewinding of generators and their conversion to static excitation, and switch yard and transformer installations. Mat is licensed patent lawyer Atlanta to practice law in Georgia and Washington. Mat is also registered patent attorney Atlanta to practice before the U.S. Patent and Trademark Office. I founded Grell & Watson, a group of IP Lawyers in Atlanta GA, specializes in Intellectual Property Law – Patent, Trademark, Copyright, applications and searches, Business Contracts, & Licensing. We are a group of IP Attorneys specializing as Patent Attorney, IP Attorneys, Patent Attorneys, IP Lawyers, Patent Lawyer, Trademark Attorney, and Trademark lawyer. G&W’s unique business model of reducing the overhead costs of traditional law firms while still maintaining all of the resources required of IP law firms, allows GW a group of attorneys in Atlanta GA to serve Atlanta and the rest of Georgia in an extremely efficient manner that will be economically beneficial for the clients and the community. We are a group of Patent Attorneys in Atlanta serving Atlanta and the surrounding Georgia cities – Patent Lawyer Johns Creek, Alpharetta, Dunwoody, Norcross, Lawrenceville, Duluth, Sugar Hill, Snellville, Augusta, Savannah.Trademark Attorney, Trademark Lawyer. If you are looking for a Patent Attorney near me call Grell & Watson.